Thursday 9:00 am – 5:30 pm The library will be closed this Thursday for Staff Training! If you end up listening to the poem inside the library, be sure to be aware and respectful of other patrons and the librarians. Photography of the building is allowed, but photography of other people is not. The Central Library was finished October 17, 1917. 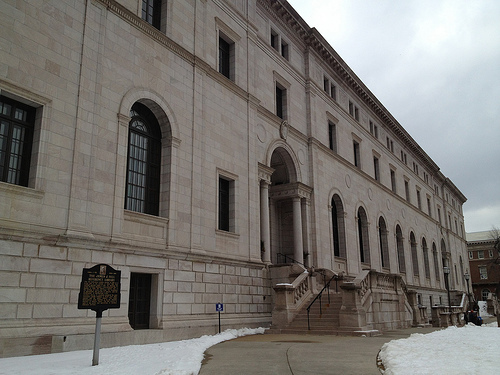 The exterior features Tennessee Marble, the interior features wood and stone from Minnesota locations. “While most of St. Paul’s citizens applauded the library’s move to larger quarters, the chair of the library board did not. With eerie prescience, former Minnesota governer Alexander Ramsey pointed out to his fellow library board members that the move “would be from a fire-proof building to constan” A wooden awning, supported by poles handy for typing up a horse or team, shaded the sidewalk around the Market House. First-floor tenants included Clark’s Restaurant, the Sharood Shoe Store, Boe’s Millinery, Toumley’s Cigar Store, the Central Clothing Store, and fatefully, the Bosalis and Papas Confectionary. – from A Noble Task by Biloine W. Young. Now with 99% less snow! Previous Previous post: What are your favorite places in Minneapolis and Saint Paul? Next Next post: Release Day! The Beast is loose!